Periodic planned maintenance is essential to ensure trouble free and efficient operation of the machinery, prevent damage to equipments and reduce break downs. Main engine piston, exhaust valve and fuel injectors are the key components of a diesel engine. Their good health is vital for the efficiency of engine. Boiler burner is another component which directly affects the combustion condition in auxiliary boiler furnace. 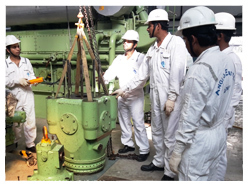 This module im-parts structured hands on training to 2Es and 3Es on these components as well as their roles and responsibilities to make dry docking cost effective. 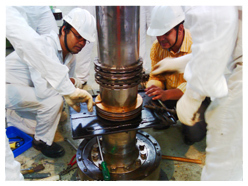 Disassembly, inspection, overhauling procedure and assembly of the followings as per guidelines given in the instruction manual. MAN B&W-MC engine piston rod stuffing box. Sulzer RTA and B&W MC engine exhaust valves. B&W MC engine conventional as well as slide type of fuel injector. Overhauling of rotary cup burner and pressure jet burner. 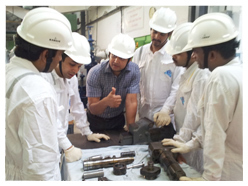 Importance and systematic procedure for carrying out main engine inspection through scavenge ports. 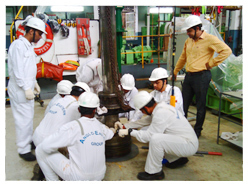 Preparation & inspections at the time of dry docking. Roles and responsibilities of engineers to make dry docking cost effective.